We’ll be up close and personal in delivering knockout previews on some of the biggest bouts on the planet. 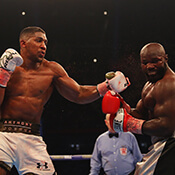 If you love betting on boxing, check out our tips on major world and European title fights that everybody is talking about. Our boxing betting experts will examine form, where the fight will be won or lost and pick out our best odds ahead of showtime. Box clever with BetStars and let us take you ringside. Will Freddie be lucky for some with his 13/1 acca? It's a huge weekend of sport and one of the biggest match-ups of all is Andrew 'Freddie' Flintoff against the BetStars Traders. Can Freddie trust his gut and beat the army of Traders to an acca victory? Will his instinct defeat the Traders' cold-hard stats? There's only one way to find out!